This page lists all the document formats supported by the parsers in Apache Tika 1.19.1. Follow the links to the various parser class javadocs for more detailed information about each document format and how it is parsed by Tika. Please note that Apache Tika is able to detect a much wider range of formats than those listed below, this page only documents those formats from which Tika is able to extract metadata and/or textual content. Old, pre-OLE2 Excel files (Excel 2, 3 and 4) are handled by the OldExcelParser. The older, pre-OOXML pure-XML, office file formats are handled by SpreadsheetMLParser, WordMLParser and Word2006MLParser. Temporary Office lock files (owner files) are supported for basic metadata extraction by MSOwnerFileParser. The various iWorks document formats (Numbers, Pages, Keynote) are supported by the IWorkPackageParser class, which extracts text and metadata. The Corel WordPerfect Office Suite formats are supported by WordPerfectParser, supporting WordPerfect WP6+ files, and QuattroProParser, supporting QuattroPro QPW v9+ files. The FictionBookParser class supports the xml-based Fiction Book publishing format. Additionally, the RarParser class supports the RAR archive format, which isn't supported by Commons Compress. The AppleSingleFileParser class supports resources packaged within AppleSingle and AppleDouble files. The FeedParser class supports the RSS and Atom feed syndication formats. The IptcAnpaParser class supports the IPTC ANPA News Wire feed format. The ChmParser class supports the CHM Help format. Tika can detect several common audio formats and extract metadata from them. Even text extraction is supported for some audio files that contain lyrics or other textual content. Extracted metadata includes sampling rates, channels, format information, artists, titles etc. The AudioParser and MidiParser classes use standard javax.sound features to process simple audio formats. The Mp3Parser class adds support for the widely used MP3 format, and the MP4Parser class provides it for MP4 audio. The Ogg family of audio formats (Vorbis, Speex, Opus, Flac etc) are supported by the VorbisParser, OpusParser, SpeexParser and FlacParser classes. The ImageParser class uses the standard javax.imageio feature to extract simple metadata from image formats supported by the Java platform, such as PNG, GIF and BMP. More complex image metadata is available through the JpegParser class and TiffParser classes that uses the metadata-extractor library to supports Exif metadata extraction from Jpeg and Tiff images. The PSDParser class extracts metadata from PSD images. The BPGParser class extracts simple metadata from BPG (Better Portable Graphics) images. The WebPParser class extracts simple metadata from WebP image format. The ICNSParser class extracts simple metadata from the Apple ICNS icon image format. When extracting from images, it is also possible to chain in Tesseract, via the TesseractOCRParser, to have OCR performed on the contents of the image. The WMFParser class extracts simple text from Microsoft WMF drawings. The EMFParser class extracts simple text from Microsoft EMF drawings, along with exposing any embedded other resources / files. Tika supports the Flash video format using a simple parsing algorithm implemented in the FLVParser class. The MP4 family of video formats (MP4, Quicktime, 3GPP etc) is supported by the MP4Parser class, which extracts metadata on the video, along with audio stream (if present). For the Ogg family of video formats, a limited amount of metadata is extracted by the OggParser class. There is also an experimental TheoraParser class which extracts only limited metadata, pending a consensus on the "right" way to return metadata for audio streams along with the video metadata. As an alternative to the metadata-focused parsers above, the PooledTimeSeriesParser can be used (if the required tool is installed) to generate a numeric representation of the video suitable for similarity searches. More details on this approach, and setup instructions for the parser + tool, can be found on the Tika wiki page for the parser. The SourceCodeParser class handles a number of source code formats, including Java, C, C++ and Groovy. It provides a formatted form of the code, along with some simple metadata. The RFC822Parser can process single email messages in the RFC 822 format used by many email clients in their archives / exports. The OutlookPSTParser can extract email messages from the Microsoft Outlook PST email format. The OutlookExtractor (part of OfficeParser) is able to extract email messages from the Microsoft Outlook MSG email format. The TNEFParser can extract email attachments from the Microsoft TNEF (Transport Neutral Encoding Format, aka Winmail.dat) used with some Microsoft email clients. The DWGParser can extract simple metadata from the DWG CAD format. The TrueTypeParser class can extract simple metadata from the TrueType font format. The AdobeFontMetricParser class does something similar for Adobe Font Metrics files. The DIFParser is able to extract attribute metadata from the GCMD Directory Interchange Format (DIF) scientific file format. The GDALParser is able to extract attribute metadata from the GDAL scientific file format. The GeographicInformationParser is able to extract attribute metadata from the ISO-19139 georgraphic information file format. The GribParser is able to extract attribute metadata from the Grib scientific file format. The HDFParser is able to extract attribute metadata from the HDF scientific file format. The ISArchiveParser is able to extract attribute metadata from the ISA-Tab (ISA Tools) family of scientific file formats. The NetCDFParser is able to extract attribute metadata from the NetCDF scientific file format. The MatParser is able to extract attribute metadata from the Matlab scientific file format. The ExecutableParser can extract metadata information on platforms, architectures and types from a range of executable formats and libraries, such as Windows Executables and Linux / BSD programs and libraries. The Pkcs7Parser is able to parse the contents of PKCS7 signed messages, but doesn't include any information from the outer PKCS7 wrapper. The TSDParser class processes metadata from Time Stamped Data Envelope files, as well as exposing the contents stored within the TSD wrapper. The SQLite3Parser is able to extract content from SQLite3 files, in a tabular form. However, it requires that the org.xerial sqlite-jdbc jar is manually added to the classpath first, as that binary jar isn't shipped as standard. The JackcessParser is able to extract metadata and content in a tabular form, from Microsoft Access database files. The DBFParser currently supports versions of dBase files (dbf) before version 7. dBase formats are used in many legacy database systems, including dBase, FoxBASE, FoxPRO and in ESRI's Shapefile format. See digitalpreservation.gov for background on this format. Tika supports calling out to a number of Natural Language Processing and Named Entity Recognition frameworks, tools and libraries. These can be used to support additional formats, or to gain extra information on existing formats. In many cases, additional tools or REST services or training datasets are required to enable or power this support. Details on the requirements and setup steps are generally given either in the parser's javadocs, or on the Tika wiki. The SentimentParser class classifies documents based on the sentiment of document, powered by Apache OpenNLP's Maximum Entropy Classifier. Tika supports calling out to a number of Object Recognition frameworks to analyse the contents of images and videos. Large training datasets and or frameworks are generally required, often accessed via REST services. The recognition package contains most of these. 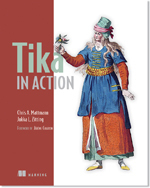 Details on the requirements and setup steps are generally given on the Tika wiki.